With just a glance at Rochelle’s resume, it becomes clear that this advice made an impact. She’s worked as a paralegal, legal writer and researcher, media consultant, producer, video editor, national recording artist, and more. With all of that, she still remains grounded and grateful for all that life has brought her. “I’m having a pretty good run,” she humbly notes. Rochelle attributes a great deal of her success to having prepared herself for things to come by attending Ivy Tech Community College. When she graduated from high school, Rochelle wasn’t sure what she wanted to do with her life. Her mom suggested she go to law school, but Rochelle knew that wasn’t the path she wanted for herself. Instead, she opted to pursue an associate degree in paralegal studies at Ivy Tech. It turned out to be just the start she needed. After she graduated, she was hired by the Office of the Indiana Attorney General. She worked in the Consumer Protection Division for 10 years, under four different attorneys general. Rochelle’s experience with media law helped her make some influential connections. One was particularly notable: legendary singer Diana Ross. Rochelle was given the opportunity to audition for Ross. It went so well that Ross asked Rochelle to perform solo in front of 10,000 people at the Klipsch Music Center, known at the time as Deer Creek Music Center. As time went on, Rochelle evolved into a highly successful media professional, bringing together her passion for music, communication, and people. 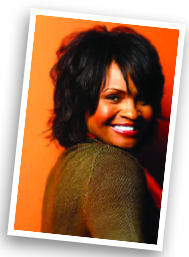 In 2005, she formed June Rochelle Media and aligned her work with her faith. As a pop and inspirational Christian artist, she has recorded three albums – with a fourth soon to be in production. Rochelle’s ability to advance and expand her business has been somewhat informed by her education, which allows her to navigate the legal side of her media ventures – such as contractual agreements – with confidence. In addition to her singing career, Rochelle now produces a children’s program called “Learn the Word TV” that features “children of color in a positive light” and focuses on education and developing good character – two things that Rochelle describes as “absolutely premier.” The positive message of the show led to it being featured on Oprah.com, the official website of Oprah Winfrey. Rochelle hasn’t let success slow her down, however. One example: she is pursuing a bachelor’s degree in business administration from Indiana Wesleyan University. And while the path Rochelle’s taking may be different than what her mother originally had in mind, it’s clear that some of the fundamental lessons she was taught have remained with her – and that when the next opportunity arises, June Rochelle will be very well prepared indeed. I to attended Ivy Tech glad to read your success story kudos to you and continue the good work. June Rochelle is truly a Woman of Faith and God VIrtue. I am Proud to call her Friend. She is dedicated to her craft and doesnt mind sharing her wisdom to all who need it.